Establishing Family Rules seems to be a popular exercise right now. 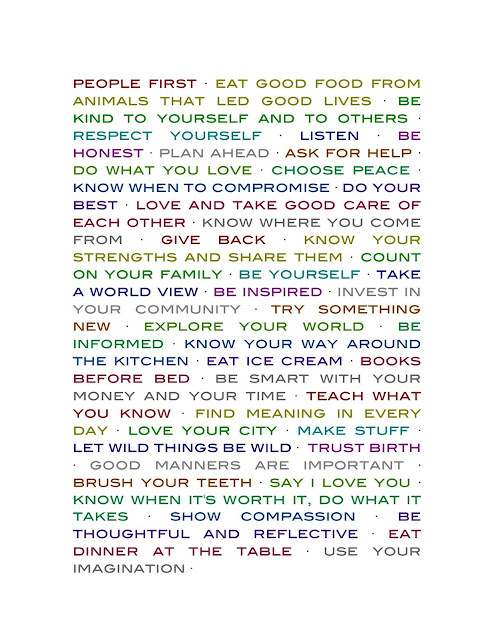 I liked the idea of thoughtfully crafting and displaying a set of phrases that capture the essence of our philosophy. After taking a look at many versions (and borrowing from them some phrases that I really liked), I spent some time one morning to develop my ideas--it may be a work in progress, although what I came up with really resonates. It was a meaningful exercise for the start of 2012. 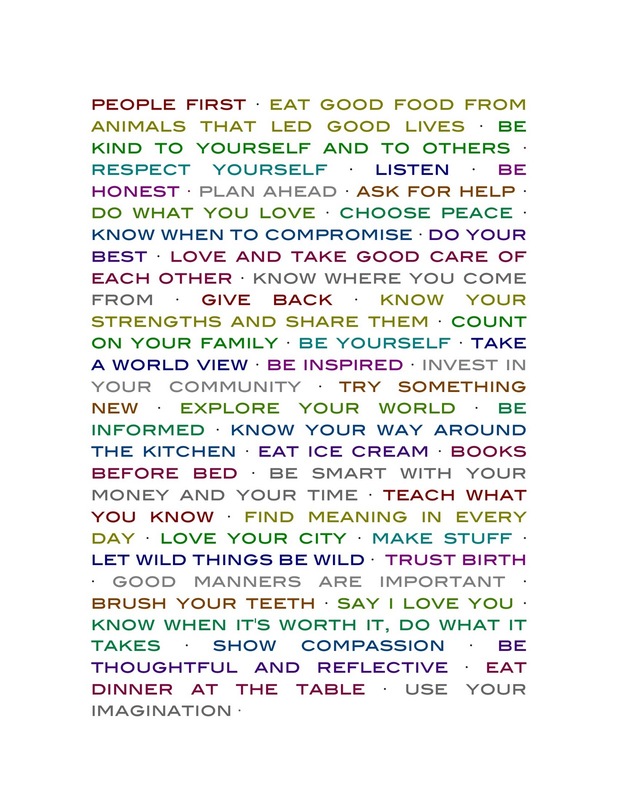 Perhaps our list will inspire you to think about (and even write down) the values and ideals that are paramount to the way that you live your life and for which you aspire your children to live theirs. This is great! Did you create this yourself? If so, what program did you use? We are starting a renovation project in our mudroom today (trying to hide our washer/dryer) and when it is done, I was thinking about hanging our family rules/values there because it is also the main entrance that we and others use to our house. I was going to just order something off Etsy, but I could probably just do it myself pretty easily. Mama Tully: your pin on pinterest got me thinking! I did this in word, and will have it printed larger to hang. I would love to have some skills in graphic artistry to really make it stand out, but I like the simplicity of it. I'll look forward to reading yours! Thank you for sharing, Happy New Year mama! Mothership: Oh you know, stuff like lose 35 pounds (ouch! ), find a diaper/camera bag, plant a flower garden, host a dinner share (just to see what they're all about), start a compost, create a budget and timeline for buying/building our next house, quit my job, take a knitting class, sew a camera strap, embark on my new career in the birthing community, start potty training Roscoe, etc. etc.! I'll send it to you if you're really interested :) I'll probably share a post (maybe, hopefully) about my lists in the next week or so. It's on my list of to-dos, ha!